The Middle English 13th Century dialectal word for a heath was "heth" or "hath", a developed form of the Olde English "heath", describing an open area of ground usually covered by gorse and heather. In fact heather and heath were often confused, and in Staffordshire "heather" actually described a heath. This confusion in itself contributed to the development of other variant spellings, as the surname requirement increased in the medieval period. 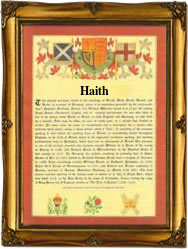 These forms included Haith, Hayth and Haet, all deriving from the original "heth", as below and describing one who lived by a heath. Late examples of the developed form(s) included: William Hath, who married Mary Johnston at Christ Church, Newgate, London, on December 2nd 1580; Mary Hayth, the daughter of Jonathon Hayth, who was christened at St. Ann's Blackfriars, London, on October 10th 1656; and Edward Haith, a christening witness at St. Luke's Church, Chelsea, on November 19th 1806, in the reign of George 111 (1760 - 1820). The first recorded spelling of the family name is shown to be that of John de la Heth, which was dated 1248, in the "Fine Court Rolls of Essex", during the reign of King Henry 111, known as "The Frenchman", 1216 - 1272. Surnames became necessary when governments introduced personal taxation. In England this was known as Poll Tax. Throughout the centuries, surnames in every country have continued to "develop" often leading to astonishing variants of the original spelling.